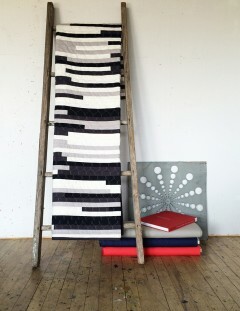 Heather Jones makes beautiful quilts and she does it her way. Uncompromising in her desire to create designs unlike any she’s seen before, Heather creates pieces that pay tribute to her community and often feature designs rooted in the Ohio landscape that she soaks up as an artist living with her family near Cincinnati. 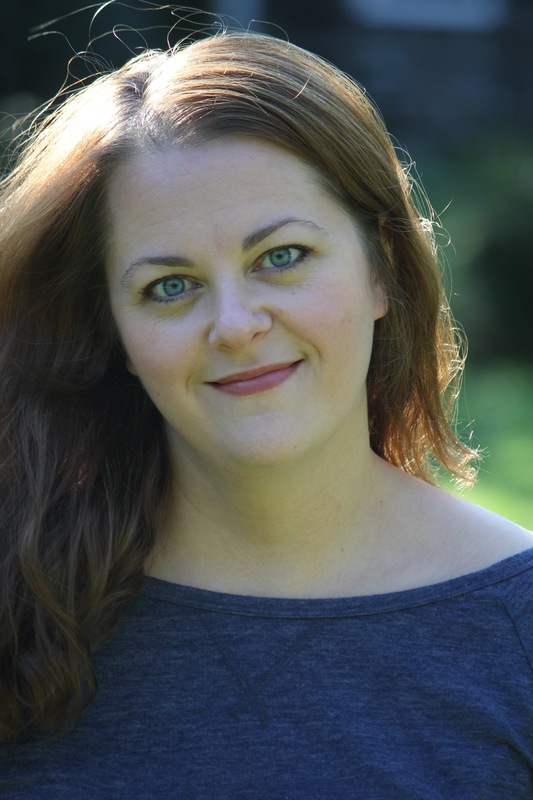 In five short years, Heather, 39, has transitioned from a rookie quilt maker to founder of the Cincinnati Modern Quilt Guild and an accomplished designer exhibiting her work and teaching on the national quilt scene. 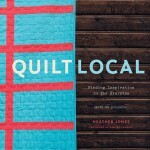 From windows at the bank and painted grids in parking lots to concentric rings at the train station and the hen house on a family friend’s farm, Heather is dialed in to all the inspiration swirling around her and sets out to show others how to extract inspiration from their surroundings in her book “Quilt Local: Finding Inspiration in the Everyday.” In the 160-page book ($27.50), Heather presents 20 quilt projects in two color ways and tells the stories behind each designs giving readers insight into the origin of each design. 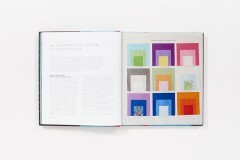 Color theory basics and Heather tips her hat to Josef Albers, a color theorist who wrote “The Intersection of Color” and was known for his “Homage to the Square” series of painted studies of squares floating within squares depicting the relationship of adjacent colors. 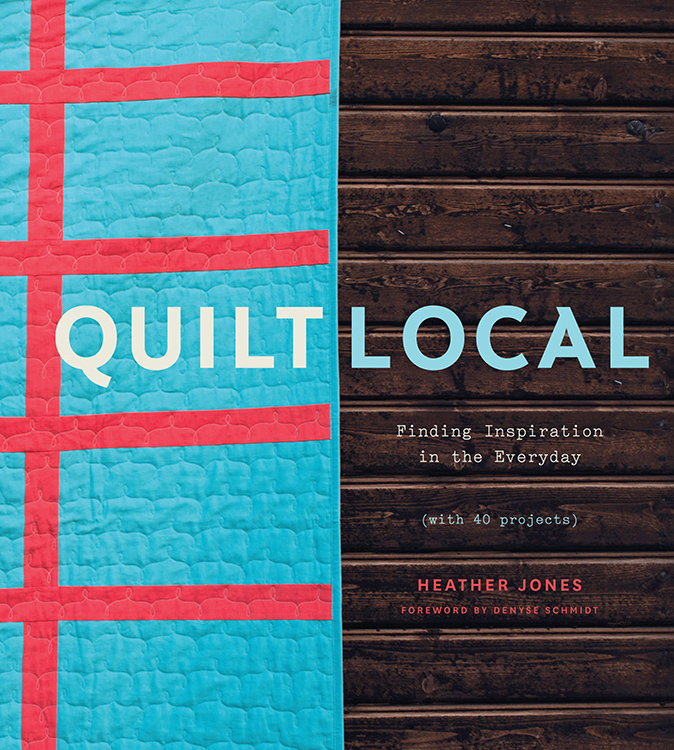 This beauty of Heather’s book is that it is accessible to quilters of our levels packed with inspiration for rookies and veterancs alike. 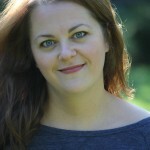 Tune into the podcast to hear Heather tell her story. And then scroll down to read my Q&A with Heather and she more lovely photos of her work. On the podcast we recorded you discuss how you got into quilting around 2010 and quickly got very deep into quilting, designing and teaching. And now, just five years later, you have a lovely book in your hands. Please share a bit about what led you to the sewing machine and how you were able to establish yourself on the national quilt scene so quickly. 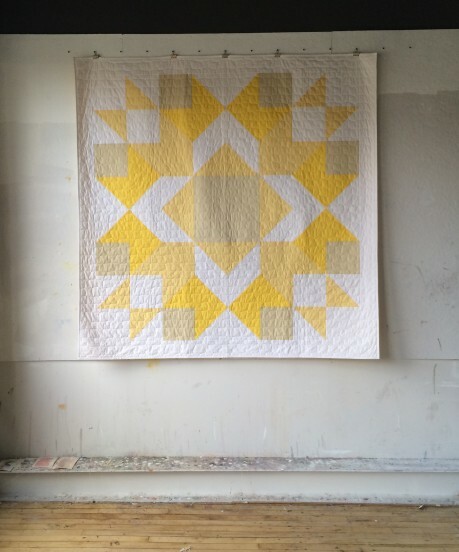 I have always loved quilts, especially antique and vintage ones, but I was intimidated by the thought of making a quilt myself because they looked like they were so much work. I had a few quilts that my great-great aunt Ollie made, but nobody else in my family quilted, so it wasn’t something that I grew up with. I think a number of things really lit my fire in terms of making quilts: first was seeing the original Gee’s Bend exhibit when it was on display at the Cleveland Museum of Art in 2004; the amazing work of Denyse Schmidt; and the rise of the Modern Quilt Guild in 2009. 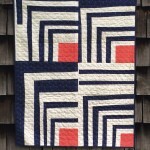 Around that time I really began to look at quilting blogs and it was great to see so many beautiful modern quilts online, but I loved the idea of coming together with people in my area, in person, to learn about modern quilting. I looked to see if there was a chapter of the Modern Quilt Guild in Cincinnati, and when I found that there was not, I decided to start one. Our original group of members communicated for a couple of months online and then had our first meeting in April of 2010. At that point in time, I had made a couple of quilts, but by no means did I consider myself a quilter. 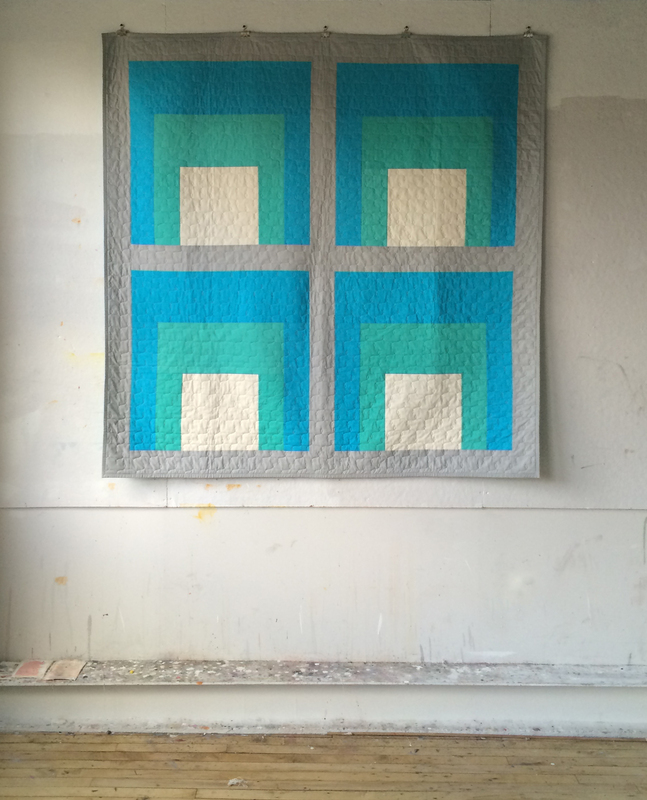 However, since I was nominated to be the president of the newly formed Cincinnati Modern Quilt Guild, I felt like I needed to walk the walk, so to speak, and then began to make quilts regularly. I have never really been interested in following patterns, so I began to create my own quilt designs and write patterns to accompany them. The Modern Quilt Guild had a four-part design challenge that ran from 2010-2011 where there were different themes throughout the year, from creating a monochromatic quilt to designing a project that showcased one’s voice as a quilter. I decided to take part in these challenges to challenge myself, and to stretch myself creatively. To my utter surprise, I was chosen a winner in three of the four challenges, which brought a lot of attention to my work. 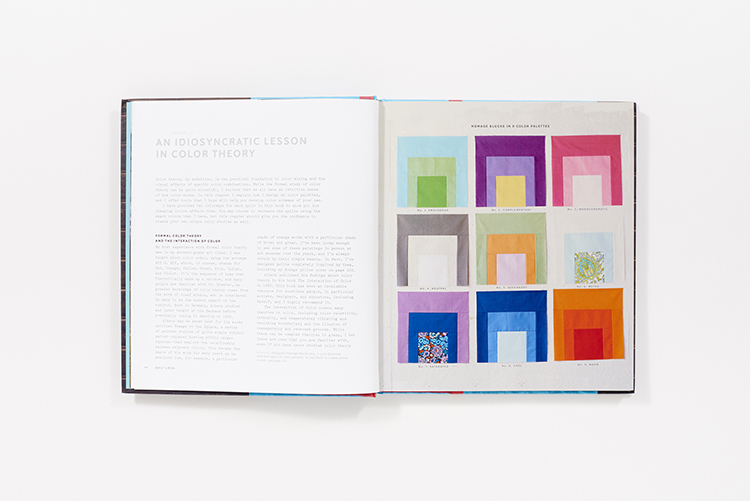 In addition to providing instructions to make 20 quilts in your new book, “Quilt Local,” you cover everything from color theory to how you find inspiration. How does it feel to be able to share this collection of work and wisdom with the world? What has been the most gratifying part of the process? It feels really exciting! It certainly was a labor of love and one that has been in the making for quite a long time. I think the most gratifying part of the process will be when I see what readers will create based on what inspires them. I also loved working with by editor, Melanie Falick, throughout the process, and with my photographer, Jenny Hallengren, especially when we were together in Ohio last year for the on-location photo shoot for the book. Your quilts are beautiful and all your own design. What do you love about not following patterns and designing quilts inspired by your own community and experience? Thank you! I love the challenge of translating the inspiration that I find into my designs. It’s also exciting to create designs that are completely my own, and that don’t look like anything else out there. I also love creating work that is so tied to the sense of place, because each design becomes an homage of sorts to what inspired it. Minimal, graphically bold, with strong lines and a unique sense of color. Who inspires your creative work? In my day to day life, it’s my husband and children, without a doubt. 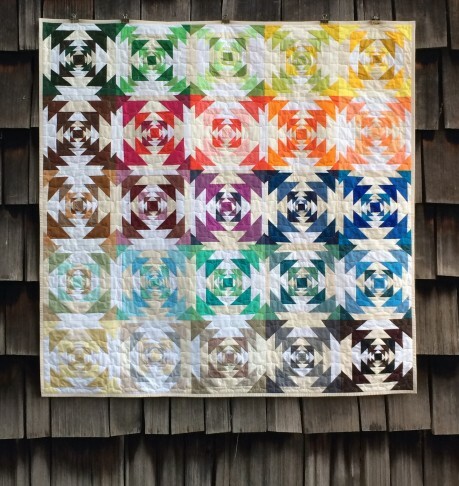 I’m also inspired greatly by the work of Denyse Schmidt, the quilters of Gee’s Bend, and the countless unnamed (mostly) women who were the makers of some of my favorite antique quilts. 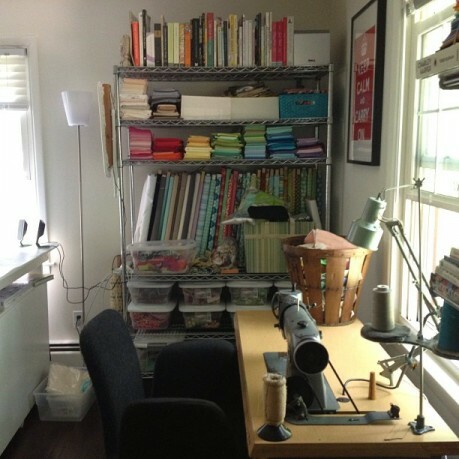 How has motherhood influenced your quilting and handmade business? If it weren’t for my children, I wouldn’t be doing this. I began a handmade business soon after the birth of my first child, Aidan. When he was born in 2006, there were not many cute things for boys (in my opinion) on the market, so I began to make my own. Soon after, friends asked me to make things for them and their own children, and I started a shop on Etsy where I focused on handmade clothing and accessories for babies and children. I named my business Olive and Ollie, named after my great-grandmother and my great-great aunt, respectively. After the birth of my second child, Olivia, in 2008, I focused on growing the business, because I knew I didn’t want to go back to my day job with two young children. I like to visit some of my favorite places that always tend to inspire me when I’m feeling creatively blocked. I love to go to local parks, museums, and the zoo, and when I do, I always end up taking tons of photos with my cell phone and walk away with some new ideas. What sewing/quilting tool tops your list of must-have supplies? A good hot, iron with lots of steam. I love solid colored cottons. That’s a tough one! But, my favorite book of all time probably is “The Monster at the End of This Book.” It’s a Little Golden Book staring Grover from Sesame Street, and it was my favorite book as a child and I still love it so much today. I’m rereading “To Kill a Mockingbird” by Harper Lee. I’m still deciding on whether or not I’ll read “Go Set a Watchman,” but I thought I needed to revisit her original book, regardless. If you had to pick a theme song, what would it be? That’s a hard one, too! It would probably have to be something by U2, though. I think I’m more of a night owl by nature, although I’ve gotten in the habit of waking up early, before anyone else in my house is awake, to work when the house is quite. It’s really satisfying to get a head start on the day by spending some time in the studio. What is your favorite food? Do you have a favorite recipe that you’re willing to share? I love Mexican food, and I’ve been making these sweet potato and black bean tacos a lot lately. It would probably be Michelangelo. I think he was a creative genius, although I’d much rather visit his studio than have him in mine! What advice do you have for those looking to launch into a new creative venture? Follow your heart and trust your own instincts. There is no instruction manual for a handmade or creative business, so sometimes it’s a bit of trial and error, and learning as you go. I’m a firm believer in the fact that you can do anything that you want as long as you’re willing to work hard and be true to yourself. What do you wish you would have known when you started your business? It’s ok to say no if it doesn’t feel right. A little known fact about me is that I started college as a pre-med major, before changing to Art History, and I actually have a minor in Chemistry. I truly enjoyed this episode! I recently took a risk myself this summer, stepping down from full time faculty to adjunct. And everywhere I look it has shown to be a scary but positive experience. I am happier than ever, going after my dream and pursuing my quilting and plush making into something bigger! It was nice to hear more of taking a risk and doing what you love.